Christopher Buccafusco & Jeanne C. Fromer, Fashion’s Function in Intellectual Property Law, 93 Notre Dame L. Rev. (forthcoming 2017), available at SSRN. Copyright is meant to protect artistic and literary works (books, paintings, sculptures, poems, songs, etc.) against copying. Copyright is not, however, meant to protect useful things – that is the job of patent law. A lot of useful things, however, are also pretty (and the other way around). Think about attractive kitchen appliances, or apparel, or furniture, or dining utensils, or indeed just about any artifact of industrial design. A well-designed ladies’ dress can keep its wearer warm, but most consumers probably value it primarily for its style. Does copyright protect the design of the dress? Or does the dress’s utility rule it out of copyright? Christopher Buccafusco of Cardozo Law and Jeanne Fromer of the NYU School of Law have written a fascinating take on this question, titled Fashion’s Function in Intellectual Property Law, forthcoming in the Notre Dame Law Review, and available here. I liked the Buccafusco/Fromer article a lot, so much so that I wish the Supreme Court had paid more attention to it in its decision in Star Athletica, L.L.C. v. Varsity Brands, Inc., a recent case in which the Court established a test for determining whether particular pictorial, graphic, or sculptural (“PGS”) elements of useful articles are “separable” from the article’s useful function, and thus copyrightable. Buccafusco and Fromer presented the article’s arguments to the Court in a terrific amicus brief, which you can find here. Precisely what that Star Athletica separability test is, and how it applies to actual cases, are fascinating questions, but they are not the focus of this review. Rather, the key question that the Buccafusco/Fromer article explores is a necessary antecedent to the Supreme Court’s separability analysis. If we are inquiring whether particular PGS features are “separable” from an article’s useful function, we have to understand what that useful function is. That “altering appearance” form of utility is easy to see in the case of a very specialized form of apparel – military camouflage. When we look at a soldier in camo, we understand that the function of that outfit is to “alter appearance” by helping the wearer blend into the background. The question is perhaps less clear when it comes to cheerleading outfits, which, unlike camouflage, are not meant to conceal. And yet our understanding of how, precisely, a cheerleading uniform is “useful” is crucial because it shapes our analysis regarding whether particular PGS elements of a garment are “separable,” and therefore potentially copyrightable. Consider “Design 078,” pictured below, which is one of the cheerleading uniform designs that was at issue in the Star Athletica case. If you believe, as the Sixth Circuit majority held explicitly, and the Supreme Court held implicitly, that the function of this garment is to “cover the body, wick away moisture, and withstand the rigors of athletic movements,” then you might conclude that the claimed PGS design elements – i.e., the patterns of stripes, chevrons, zigzags, and color-blocking – are separable from that useful function (and, if they meet copyright’s originality standard, protectable) because they do not contribute to it. On the other hand, if you believe, as Profs. Buccafusco and Fromer argue, that the design elements just mentioned “are simultaneously both expressive and functional, serving to accentuate and elongate the cheerleader’s body and make it appear curvier in particular areas,” then the claimed design elements are themselves functional, are part of the garment’s utility, cannot be separated from that utility, and are therefore not copyrightable. Profs. Buccafusco and Fromer marshal a lot of evidence from the fashion design literature in support of their argument, and these sections are a big part of why reading the article is so much fun. I won’t go into the details now (I’ll save them for your reading of the article), but I’ll say that in my view Buccafusco and Fromer have it right overall. Just look at the uniform pictured above. Any designer will tell you that the function of the color-blocking (i.e., the contrast between the white triangular side panels and the dark-colored hourglass shape on the front of the uniform) is to accentuate the wearer’s bust and narrow the appearance of her waist. Now look at the inverted “V” pointing up toward the wearer’s neck, and the downward-pointing “V” that makes up the hem of the skirt – the combination of these two shapes exploits something called the Müller-Lyer Illusion to make the wearer’s body appear longer. The same is true of the smaller “V” notched into the skirt hem – that shape functions to lengthen the appearance of the wearer’s leg. The stripes, chevrons, zigzags, and color-blocking that form the heart of Varsity’s uniform designs … are the reason that the designs work as appropriate designs for garments meant to emphasize the fitness, athleticism, and attractiveness of those who don them. 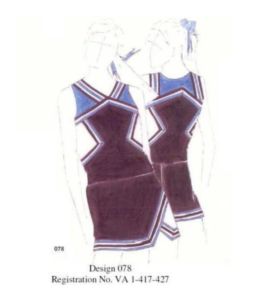 It is no accident that the plaintiff here chose to design its uniforms in this fashion, and it is no accident that many cheerleading uniforms share similar design features. Granting copyright protection for these designs would enable Varsity to monopolize functional aspects of garments without satisfying the exacting demands of patent law. Although other designers might be free to produce cheerleading uniforms incorporating features that flatten the bust, widen the waist, and shorten the legs, we suspect that they are unlikely to find a vibrant market for such products. This is not the sort of competitive advantage that copyright law is intended to foster. As I mentioned earlier, the Buccafusco/Fromer arguments regarding the broader utility of apparel designs were ignored by the Court, which said nothing in its Star Athletica opinion about how to define the utility of any particular useful article. That’s lamentable, but it’s also an opportunity. In the coming years, courts will be considering the separability – and the copyright eligibility – of PGS elements embedded in an enormous range of useful articles. Many of the Buccafusco/Fromer insights regarding the intertwining of form and function in apparel design could be relevant to cases involving useful articles other than apparel. And even in instances where those insights don’t apply directly outside apparel, they point the way for a richer analysis of the relationship of form and function across the field of industrial design. Cite as: Christopher J. Sprigman, Copyright Law and the Utility of Style, JOTWELL (September 7, 2017) (reviewing Christopher Buccafusco & Jeanne C. Fromer, Fashion’s Function in Intellectual Property Law, 93 Notre Dame L. Rev. (forthcoming 2017), available at SSRN), https://ip.jotwell.com/copyright-law-and-the-utility-of-style/.